William Jefferson, shown with his wife, Andrea, represented the New Orleans area in Congress for 18 years. 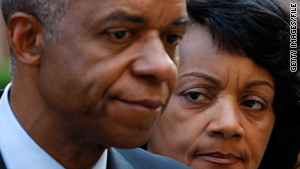 Alexandria, Virginia (CNN) -- Former U.S. Rep. William Jefferson was sentenced Friday to 13 years in prison followed by three years of supervised release for his conviction on 11 counts of corruption. Jefferson was also ordered to forfeit more than $470,000 after his conviction for using his office to solicit bribes. He will also have to pay $1,100 in special assessments. The case against the former nine-term Louisiana Democrat included allegations of influence-peddling and the discovery of $90,000 in cash in his freezer. Judge T.S. Ellis will determine at a hearing next Wednesday whether Jefferson will remain free pending appeal. Until then, he is free. "The court's sentence today reaffirms the principle that all people -- no matter what their title or position -- are equal before the law," said Principal Deputy Assistant Attorney General Mythili Raman in a statement. "In a stunning betrayal of the public's trust, former Congressman Jefferson repeatedly used his public office for private gain. The lengthy prison sentence imposed on Mr. Jefferson today is a stark reminder to all public officials that the consequences of accepting bribes can and will be severe." Jefferson's family was in the courtroom when District Judge T.S. Ellis handed down the sentence. He had faced up to 150 years in prison. "This sentence should be a clear signal that our society will not tolerate bribery," U.S. Attorney Neil H. MacBride said in a written statement. "It's not just another cost of doing business in government. "Mr. Jefferson's repeated attempts to sell his office caused significant damage to the public's trust in our elected leaders. This sentence will begin to repair that damage and to restore that trust. "Mr. Jefferson is well-known for the $90,000 found in his freezer. It is our hope that he will now be well-known for the tough sentence handed down today, showing that no one -- including our elected officials -- are above the law." Jefferson, of New Orleans, still faces the forfeiture of nearly $500,000 -- money a jury said is linked to criminal activity for which he has been convicted. On August 5, a jury found Jefferson guilty on four bribery counts, three counts of money laundering, three counts of wire fraud and one count of racketeering. He was acquitted on five other counts, including wire fraud and obstruction of justice. He had remained free prior to Friday's sentencing. Jefferson was indicted by a federal grand jury on June 4, 2007, about two years after federal agents said they found the money in his freezer. Authorities said the cash was part of a payment in marked bills from an FBI informant in a transaction captured on video. The trial was delayed while it was resolved whether an FBI search of Jefferson's congressional office was constitutional. Defense attorney Robert Trout had asked the judge for leniency, citing Jefferson's personal history of humble beginnings and long-standing public service. Prosecutors, in turn, filed a response saying Jefferson deserved no preferential treatment since he "still chose to cheat, steal and lie." "Congressman Jefferson has still not accepted responsibility for his own criminal conduct," prosecutors wrote. He "still rationalizes his own unethical, illegal and immoral conduct." CNN's Paul Courson contributed to this report.